Abstract: The EL PC4200 memory modules are in fact rated to run at 266 MHz, while maintaining the aforementioned CAS latency timings of 2.5-4-4-7. One problem that is universal to among all 'high speed' memory modules is that to reach the fastest speeds they must be set to use very lax CAS latency timings. As most experienced computer users understand, CAS timings play a key role in overall system performance. The looser the timings, the greater impact on total system performance we tend to see. In and effort to combat this, OCZ Technology has recently introduced a new memory product which purports to run faster than the competition, with tighter timing to boot. Whether this claim is accurate or not remains to be seen, so hold on just a second before we drive right into the benchmarks. First, let's talk a little bit about this heafty little pair of copper-clad DDR modules. Dubbed, Enhanced Latency PC4200 (DDR533) DDR RAM, this 512MB pair (1GB total) of dual channel DDR boasts CAS timings of 2.5-4-4-7, and comes packed in standard OCZ copper heatspreaders. Copper has always been a good indicator that something mighty lies below, so is this really a sign of what to expect from OCZ's memory? The "EL" in the "EL PC4200" moniker stands 'Enhanced Latency', but what does that really mean? Well, according to the company, the 'EL' designation is applied to memory modules which are able to run at tighter CAS latency timings than the current JEDEC standards. Unfortunately, OCZ's EL PC4200 memory is not capable of running with a latency values of 2-2-2-5, and frankly we're not aware of any modules in the PC4200 range that are either. Instead, the EL PC4200 memory runs with a bit tighter timings than you could expect to see on other similarly paced PC4200 modules. The EL PC4200 memory modules are in fact rated to run at 266 MHz, while maintaining the aforementioned CAS latency timings of 2.5-4-4-7. While other manufacturers do have flagship memory capable of running at similar speeds, they tend to lag behind slightly with timings of 3-4-4-8. All things being equal, that means OCZ's EL PC4200 memory should be quicker. 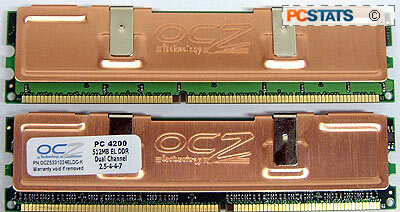 OCZ shield the DRAM memory modules behind a set of nice copper heat spreaders. The slabs of metal seemed to do their job just fine as the modules sweated under the stress of benchmarking. Each 512MB EL PC4200 stick is double sided, meaning there are eight 256Mbit DRAM chips on each sie of the six layer PCB. Other then that, the memory is your plain old standard TSOP-II packaging. Given the correct supporting motherboard and chipset, each stick is rated to run at 266 MHz FSB while maintaining 2.5-4-4-7 memory timings at a voltage of 2.8V. That voltage figure may seem high, but keep in mind that Corsair's TwinX 4000 memory require 2.75V to get to 250 MHz. Also, JEDEC recently ratified the 'default voltage' spec for PC3200 memory from 2.5V to 2.6V.